Harold A. Davis was the first ghostwriter to fill in for Lester Dent on Doc Savage. And if not for his work on this character, even fewer people today would have heard of Davis. Davis wrote under a variety of pseudonyms as well as his own name. He didn’t create any high-profile characters; he wasn’t a prolific pulp powerhouse like so many of the writers of the time who remain well known today. He didn’t move from the pulps to the slicks and then to book sales. In baseball parlance, he was a utility player, with his stories filling pages where needed. So, although Davis stories appeared in what we consider relatively stable and well-remembered publications — among them The Shadow Magazine, Doc Savage Magazine, Pete Rice Magazine, Crime Busters, The Feds — Davis himself remained a low-profile writer in the great scheme of pulp history. As a result, not a great deal of information has been recorded about his life and career. Here’s what we know about the basics: He was born Harold Arvine Davis January 16, 1903. At one point he worked for the New York Daily News. 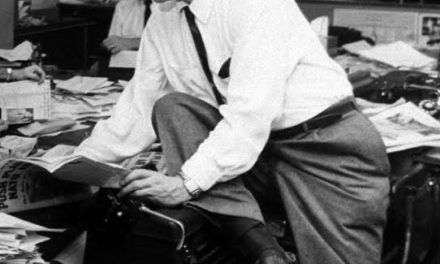 He was a telegraph editor for the Los Angeles Daily News. He died in Los Angeles, California. He was apparently estranged from his family at the time of his death, January 8, 1955, because his obituary in the January 11, 1955, Los Angeles Times reported that Davis was survived by “his widow, Mari Anne Davis, and two daughters, Helen and Susan, all of Elmhurst, Long Island, N.Y.” He was buried at Forest Lawn-Hollywood Hills Memorial Park. Davis’ pulp-writing career was launched thanks to the man he would later ghost for, Lester Dent. 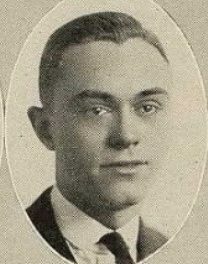 According to Doc and Dent scholar Will Murray, Dent met Davis during the 1920s when the two both worked at the same newspaper, the Tulsa World. Davis eventually followed Dent to the city during the early 1930s. Once again residing in the same town, the two newspapermen renewed their acquaintance. Dent introduced his old pal to the editors at Street & Smith. 1934 is the year Davis’ pulp-writing career began. The earliest Davis appearance is in Doc Savage; the date is March 1934. His last pulp appearance is, appropriately enough, also in Doc Savage; the date is September 1946 for the Doc novel The Exploding Lake. We assume today that Dent touched these ghosted novels — evidence in some cases suggests quite a bit of work on his part — so these tales don’t represent “pure” Davis. We need to look at least a bit at Davis’ work as a Doc ghost because he holds the honor of being the first in that role. And that event resulted thanks to what appears to be Lester Dent’s shrewd business sense. 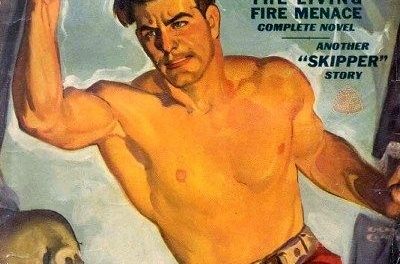 Dent’s contract with S&S gave him the rights over Doc Savage in media other than the magazine (and, presumably, books, since S&S reprinted select Doc novels in their Ideal Library series). So, when the opportunity arose to write scripts for a Doc radio show in 1933, Dent needed to hand off the chore of writing some Doc novels. According to Will Murray’s introduction to The Incredible Radio Exploits of Doc Savage Volume 1, Lester Dent made a contract with Davis for the latter to act as ghost writer for the Doc novels. The result was the first non-Dent Doc pulp, The King Maker. When we think of Doc Savage adventures today, we think of exotic locales. Indeed, the first Doc tale takes the reader to Hidalgo and the Valley of the Vanished. “Vanished” is a good word here, for most of these settings that come to mind are relatively inaccessible, lost cities and races and such. But a sense of real-life international politics and conflict characterize Davis’ first two novels. Perhaps Davis’ background in newspapers helped him develop a sense of verisimilitude for these two novels. These two stories place Doc on the world stage and involve him in large public events. The action in The King Maker swirls around a war, a revolt in a Balkan country. The resemblance to real-world events is also present in Davis’ second Doc tale, Dust of Death, which embroils the band of scrappy adventurers in a war between two South American republics. Some of Davis’ succeeding Doc novels follow this lead. For instance, an armed revolt plays an integral part in The Golden Peril, in which Doc and his aides return to Hidalgo and get involved in an attempted overthrow of the local government. In The Munitions Master, several governments are pulled toward world war by the eponymous villain, who sinks a U.S. Navy ship and a Japanese ship, and kills who-knows-how-many Chinese, French, British, and Mexican troops. And in Devils of the Deep, ships from various nations are destroyed in the course of the novel. And let’s not forget that Davis introduced Ham’s pet ape Chemistry to the permanent cast in Dust of Death! While not as great a moment in the supersagas as our first visit to the Fortress of Solitude or the Crime College, Chemistry ended up playing interesting roles in many plots. During the course of the many novels in which Chemistry appears, the primate sometimes seems to own a human-like intelligence, sometimes impersonating Monk by dressing in the chemist’s clothes, using a camera to take photos that later reveal useful clues, shadowing various characters, and so forth. This leads me to the second characteristic most common to Davis’ Doc tales: their almost-comic-book-style wackiness. Again, in The Purple Dragon, there are at least two more such cheats: Doc doesn’t explain until after he has escaped some death traps that bad-guy Tiler was a famous maker of magician tricks, and that information allowed Doc to search for escapes from those traps. Another weak explanation follows Doc’s escape from the death trap at the end of Devils of the Deep — there’s the sense that the reader won’t notice the lack of logic if the explanation is blurted out quickly and in little detail. A similarly unlikely explanation follows Doc’s escape from death in The Golden Peril. And as the fan who signs himself “Dr. Hermes” on the alt.fan.doc-savage news group describes at least one scene in review of The Green Death, “Monk writes on Habeas’ hairy back with the ‘invisible chalk’ — but it’s a chatty warning thirty words long. On the back of a pig.” The Living Fire Menace features humans turned into living batteries and weapons made of glass — including pistols! Logic and a reasonable suspension of disbelief, more and more frequently in Davis’ Doc novels, were thrown out the door. Dent had a far greater ability to make a preposterous situation seem likely. This latter point is reflected in Doc’s using disguises. Davis’ Doc changes faces at the drop of a hat, on the fly, on the run, as though no real effort were needed to assume a new identity; Doc apparently has handy every supply necessary for changing identities with anyone. In Dent’s best tales, the writer normally would lay some groundwork for an upcoming impersonation; he would allow Doc some prep time to take on a new identity. The third characteristic of Davis’ Doc tales: violence. Lots of folks die in Davis novels. And the threat of torture — sometimes in dungeons — pops up frequently as well. Davis might have had a successful career as a writer of weird menace pulps, had he turned his hand to that genre. For instance, both The King Maker and The Golden Peril feature dungeons and torture chambers. And the secondary villain in The Living Fire Menace, Dr. Torgle, could have stepped right out of a weird menace pulp: Twisted in both mind and body, this typical mad scientist prepares to torture or kill — it’s not immediately clear which — the unconscious Man of Bronze until other events spoil his plans. Harold Davis’ work for Doc Savage magazine clearly demonstrates that he was not among the top tier of pulp magazine fictioneers. But by comparing his short stories to the other backup tales that ran in the publication, it’s clear that he was able to fulfill the editorial needs for short, action-driven stories set in exotic and out-of-the-way locations. Duane is a Louisville based Doc Savage fan, author, and artist. His work has graced The Secret Sanctum and The Bronze Gazette. You can find his novels and short stories on Amazon. I know absolutely nothing about Harold Davis and what else he might have written. But as a Doc ghost he stands up fairly well. He may even be the best of the Doc Savage ghostwriters (at least when you think of authors like He Could Stop the Entire Series Donovan). Tales like The Green Death are solid Doc adventures with all the creepy, exotic ambiance we came to expect. When you look at his contributions, we have some substantial ones. Though not the best books, he did write the “sequel” to the Man of Bronze (The Golden Peril) and introduce Haebus Corpus (Dust of Death), for example. He also played with all the characters fairly well, stayed true to the nature of Doc Savage and the series by not getting too outlandish and wild with the mysteries, thus always keeping the solutions grounded in science and reality. 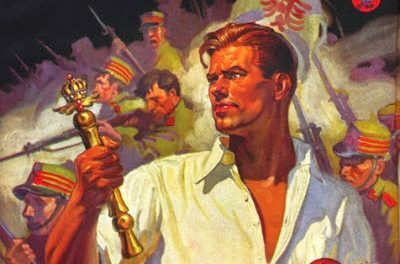 He also wrote one of the best, longest, and most memorable Docs, in the value of the test it provided to the character of Doc Savage, in The King Maker. This is a classic book and a substantial statement on the nature of Doc Savage and what his goals were in life. Furthermore, he did something I always loved to see in Doc Savage tales, he connected them. He often mentions other exploits in the middle of adventures (especially those he wrote) and creates a real-life flow and chronology in the series that is often absent. His seem to reflect people having real experiences in a real world, rather than a bunch of random stand-alone tales that never connect in any way. I like that. Is Harold Davis better than Lester Dent? No even close. But compared to the other ghostwriters, he wrote a lot of books that stand up very well on their own, honor the characters, and actually contribute something to the series. What more could we wish from a ghostwriter?